The mission of St. Francis of Assisi Parish is to be a welcoming community formed around the Eucharist and open to the workings of the Holy Spirit. We are called to be a people of prayer, serving our faith through the principle of Christian stewardship. St. Francis of Assisi Parish in Nixa, Missouri was established as a parish in April 2004, bringing the number of parishes and missions in the Roman Catholic Diocese of Springfield-Cape Girardeau to 85. When Bishop John J. Leibrecht announced the opening of this new parish, he appointed Rev. Mark G. Boyer as pastor. One of Father Boyer’s goals was for the parish to model the Vatican II concept of a self-sufficient, total stewardship, lay-driven parish. Organizational meetings were held in May 2004 when Catholics from surrounding parishes who were Nixa residents were invited to be founding members. Catholics who had not been involved in any parish also were invited. Committees were formed and possible parish names were submitted to the bishop. 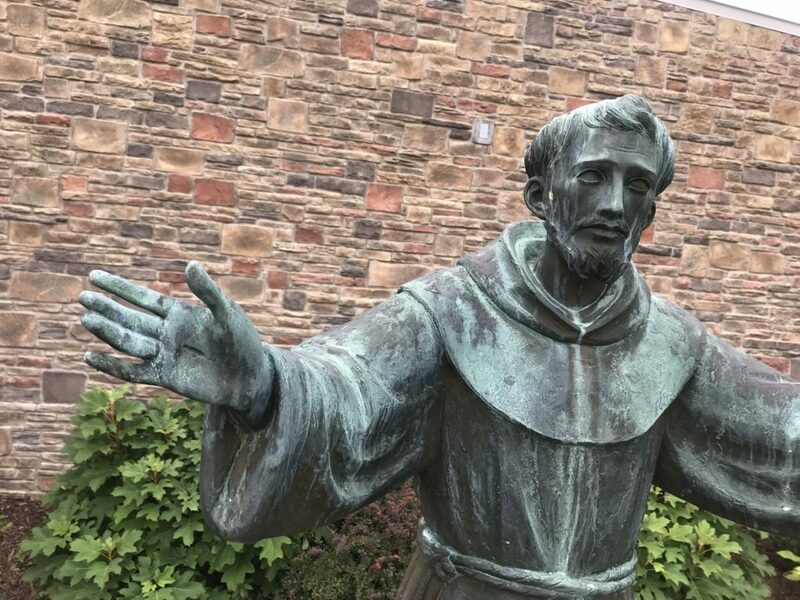 In June 2004, Bishop Leibrecht notified the community that he had chosen St. Francis of Assisi as the name of the parish. One priority was finding a temporary place to worship until the parish could build a facility on the 11 acres purchased by the diocese in 1994, located at Gregg Road and Butterfield Drive. After much research, the parish signed a lease renting several bays in a strip mall at 117 W. Sherman Way in Nixa. On July 11, 2004, one of the hottest days of the summer, members gathered for the first time as a faith community under a red and yellow canvas tent on the future building site to celebrate Mass. The altar was a simple folding table and parishioners sat on lawn chairs and blankets. A month later, on Aug. 22, 2004, St. Francis of Assisi Parish celebrated its first Mass in its temporary location on West Sherman Way with Father Boyer leading the community in the Eucharistic celebration. 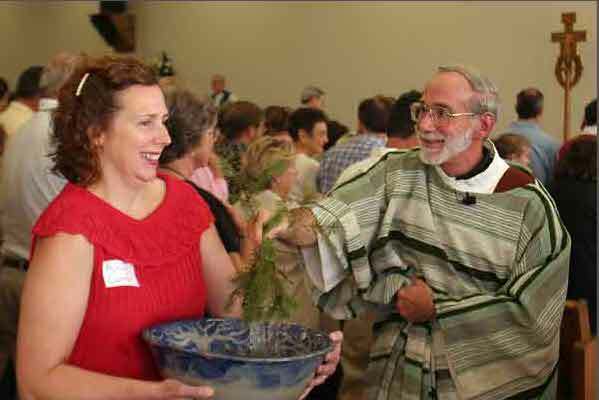 The founding parish members embraced the concept of being a Total Stewardship parish. Using the Diocese of Wichita as a model, St. Francis of Assisi Parish began learning about stewardship in a new way. “Stewardship is not just money. It is time, talent, and treasure given to God in thanksgiving for all that He has first given to us,” states one Wichita parish. From early on, parishioners began sharing their time and talent in a variety of ministries and services in the parish and community. Stewardship of treasure took the form of a commitment from each member to share in the financial health of the parish and its ministries. About three years after the parish was formed, members felt it was time to move forward with its plan for permanent facilities. To address this challenge, parish leadership in January 2007 launched a capital campaign to raise necessary funds outlined by the diocese for building the first phase of the parish’s facilities. By the end of the initial campaign, St. Francis of Assisi Parish received $425,000 in pledges to be paid over three years. On Sept. 20, 2009, Bishop James Vann Johnston, Jr., broke ground for the building of phase 1 of a permanent parish facility. This Worship and Community Center was designed by H Design Group and built by Bailey Construction Company at a cost of $1.1 million. Dedicated by Bishop Johnston on November 1, 2010, it consists of a worship space, a community space, a chapel, an education space, a meeting room, and offices. The mortgage on this building was paid in full in late 2017. The parish rectory is located in a housing subdivision just east of the church. Phase 2, the building of a permanent church, will be addressed at a future date. Father Mark Boyer served the parish from its inception in 2004 to 2011. In July 2011, Monsignor Thomas Reidy was assigned as pastor to St. Francis of Assisi. He is also pastor of St. Elizabeth Ann Seton Parish, Springfield. At that time, Father Paul Anthony Suresh Samala served as associate pastor. Sharing sacramental duties starting in 2014 was Father Michael McDevitt. In September 2017, newly-ordained priest Father Colby Elbert was named associate pastor and Father McDevitt retired as priest in residence. Copyright © 2019. St Francis of Assisi Catholic Church.